Powerline home networking has recently enjoyed a significant boost in the base transfer rates. Ostensibly the HomePlug AV specification still quotes a maximum of 200Mbps, but thanks to some clever jiggery pokery, the newer IEEE 1901 super-standard means that a new slew of HomePlug AV kit has appeared with a throughput of 500Mbps. This new standard is still compatible with the existing HomePlug AV kit, although a mix of the two types of kit will dial down to the slower 200Mbps in practice. Devolo has jumped on board the new IEEE 1901 with gusto, and has a wide range of 500Mbps adaptors and starter sets available. The Devolo dLAN 500 AVmini Starter Kit is easily the neatest implementation from the German company so far, with the small but perfectly formed units belying their inherent capabilities. This starter kit contains two adaptors, two short Ethernet cables, an installation guide and a CD holding Devolo's own dLAN Cockpit software. 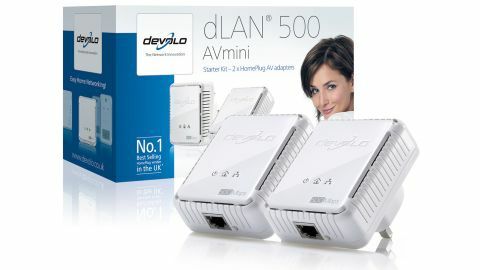 The Devolo dLAN 500 AVmini units themselves are tiny, roughly half the size of many of their rivals, with only the Netgear Powerline Nano500 Set XAVB5101 giving the units any serious competition on the tiny stakes. These boast a slightly more agreeable design than the Netgear offerings, although the compact design means that both are solidly constructed and feel like they'll survive plenty of knocks. The units boast gigabit Ethernet interfaces to ensure you get the most from your connection, although realistically you'll only max out the slower 10/100Mbps connectors found on other units if you're in the same room - which isn't really the point of Powerline adaptors. When it comes to the performance on offer, we were suitably impressed by the throughput of the dLAN 500 AVmini. The units managed an extremely high write performance, with an average throughput across a range of tests of 56.4Mbps, and a fast read performance as well, averaging out at 66.7Mbps. These tests focus on one-to-one connections, but the synthetic network test revealed that the units had the potential to hit 450Mbps with multiple units connected to the same network. While there is a lot to love when it comes to these adaptors, the most obvious strike against the dLAN 500 AVmini is the pricing. The units themselves may be tiny, solidly built and offer strong throughput, but at almost twice the price of the similarly capable TP-Link AV500 units, the price of minaturisation does seem a little steep.